GLr (r≥1) over function fields. ^ モナスティルスキー 2013, p. 27. ^ Tropp 1976, p. 181. ^ Riehm 2002, p. 781. ^ Curbera 2009, p. 111. ^ a b モナスティルスキー 2013. ^ Curbera 2009, p. 110. ^ Barany 2015, p. 17. 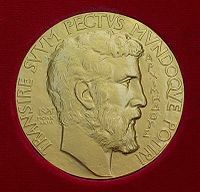 ^ “2006 Fields Medals awarded” (PDF). Notices of the American Mathematical Society (American Mathematical Society) 53 (9): 1037-1044. (2006年10月). http://www.ams.org/notices/200609/comm-prize-fields.pdf. ^ モナスティルスキー 2013, p. 19. ^ モナスティルスキー 2013, p. 34. ^ 渡辺 & 上総 1985. ^ ICM 2010, p. 23. Atiyah, Michael; Iagolnitzer, Daniel (1997). Fields Medalists' Lectures. World Scientific Series in 20th Century Mathematics. 5. World Scientific Publishing. doi:10.1142/3445. ISBN 981-02-3117-2. MR 1622945. Curbera, Guillermo P. (2009). Mathematicians of the World, Unite! : The International Congress of Mathematicians—A Human Endeavor. A. K. Peters. pp. 110–118. doi:10.1201/b10584. ISBN 978-1-56881-330-1. MR 2499757. Zbl 1166.01001. https://books.google.com/books?id=9uDqBgAAQBAJ. Riehm, Elaine McKinnon (2010), “The Fields Medal: Serendipity and J. L. Synge”, Fields Notes 10: 1–2. Riehm, Elaine McKinnon; Hoffman, Frances (2011). Turbulent Times in Mathematics: The Life of J.C. Fields and the History of the Fields Medal. AMS. doi:10.1090/mbk/080. ISBN 978-0-8218-6914-7. MR 2850575. Zbl 1247.01047. https://books.google.com/books?id=h8S_AwAAQBAJ. （原書） Monastyrsky, Michael (1997). Modern Mathematics in the Light of the Fields Medals. A. K. Peters. ISBN 1-56881-065-2. MR 1427488. Zbl 0874.01014. R. Bhatia et al., ed (2010). Proceedings of the International Congress of Mathematicians: Hyderabad 2010. I. World Scientific Publishing. ISBN 978-81-85931-08-3. MR 2840854. https://books.google.com/books?id=GFE1vx2pynMC.